Recent developments in European Consumer Law: Conference announcement: "The Transparent Trap: Disclosing Information to Consumers"
Conference announcement: "The Transparent Trap: Disclosing Information to Consumers"
The Centre for the Study of European Contract Law at the University of Amsterdam, SRH Hochschule Berlin and University of Exeter are organising together an international, interdisciplinary conference "The Transparent Trap: Disclosing Information to Consumers" on 4-5 July in Amsterdam. The aim of the conference is to go beyond the discussion of the principle of transparency as a legal instrument often used by European and national legislators to guarantee consumer protection. 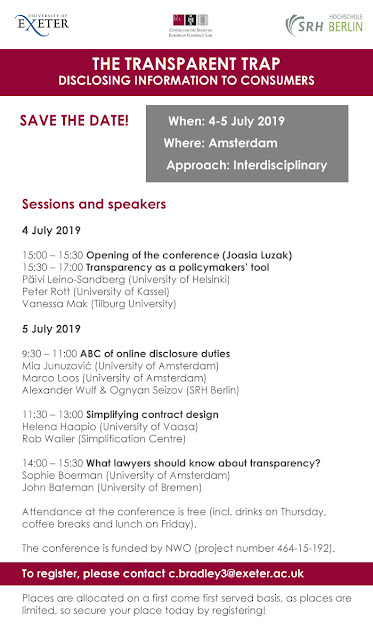 Whilst the first conference sessions will focus on the transparency requirements and limitations of disclosures to consumers, the following sessions will examine practical possibilities of providing transparent and simplified (pre-)contractual disclosures, esp. in the online environment. The detailed conference programme will be announced in due time, but for now please see the attached 'Save the Date'-poster, announcing the conference sessions and confirmed speakers. Speakers at the conference are scholars of: public and private law, communication science, linguistics, contract innovation. This event facilitates, therefore, an interdisciplinary debate on how to further improve disclosures. We are warmly inviting anyone interested in the topic (from whichever angle/discipline, academia/public or private sector) to join us in July in Amsterdam! The conference attendance is free of charge (incl. lunch on Friday), but registration is necessary (and due to the limit of space, if you are interested, please register as soon as possible). The registration details may be found on the poster.